We will be closed Thursday 18th April 2019 at 5:00pm for the Easter break, and will re-open Tuesday 23rd April 2019 at 9:00am. We will have emergency cover available to existing customers only. We would like to thank all our valued customers for their continued support Happy Easter. The cookie settings on this webpage are set to ‘allow all cookies’ to give you the very best experience. If you continue without changing these settings you consent to this - but if you want to you can change your settings at any time at the bottom of this page. Designed for installation in small spaces or restricted access areas, this high performance in-line system filter uses hydrocyclonic and magnetic filtration to remove all types of contaminants from central heating system water. The Fernox TF1 Compact Filter (UK patent granted No. 2448232) is a high performance in-line filter, which allows hydrocyclonic action to deliver contaminants to the unit�s specially designed magnet assembly, removing and containing them from the system water. The Fernox TF1 Compact Filter has been developed to fit into domestic heating systems where installation access may be restricted. 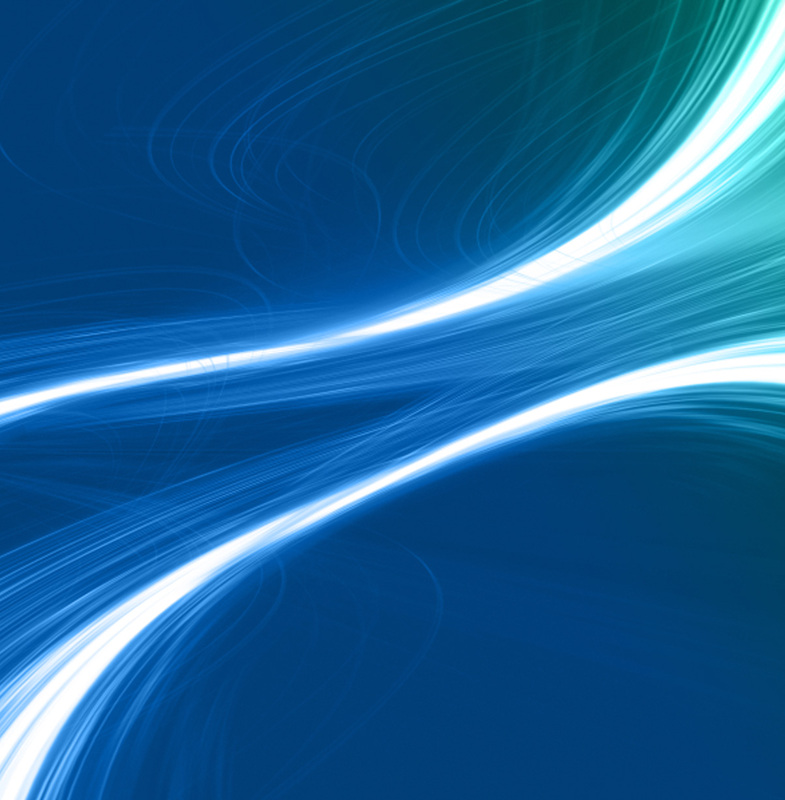 In situations where headroom is limited, the TF1 Compact Filter can be installed at an angle of 45 degrees without compromising performance, to allow magnet removal when cleaning the unit. 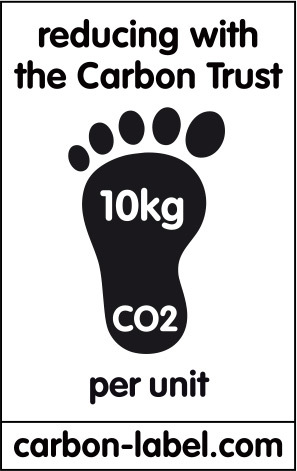 Fernox has worked with the Carbon Trust to measure carbon emissions of the Fernox TF1 Range. 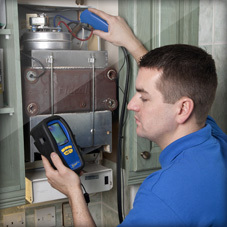 Fernox has undergone rigorous carbon analysis to enable the TF1 Range to carry the Carbon Reduction Label. 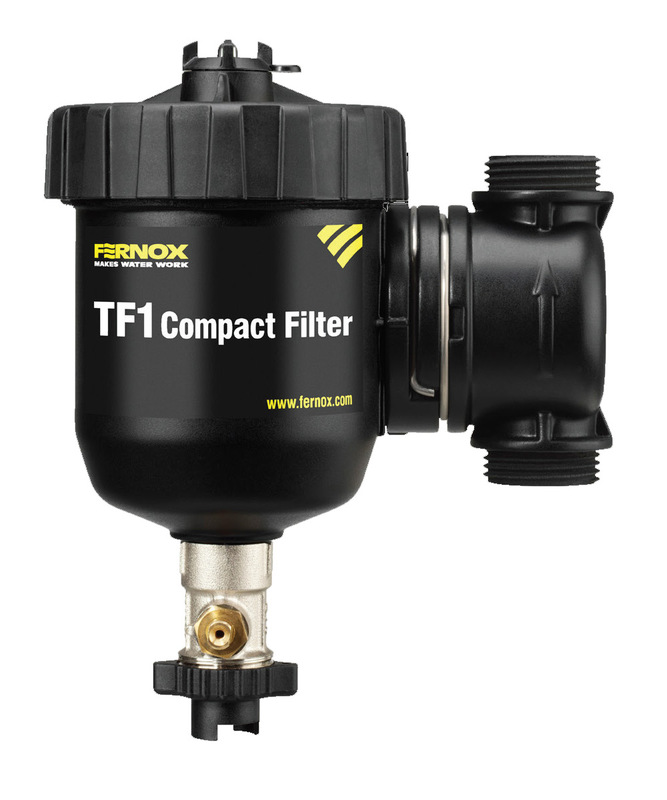 The Fernox TF1 Compact Filter can be connected directly onto pipework using the valve fittings provided. The unit can be installed in either horizontal or vertical pipework and has been conveniently designed to be positioned flush to a wall. The TF1 Compact Filter can be installed in any one of 24 separate orientations enabled by its unique inlet/outlet mechanism, to allow the flow to be in any direction as it passes through the unit. Individually packaged with all valves and detailed instructions included. No special storage requirements needed. 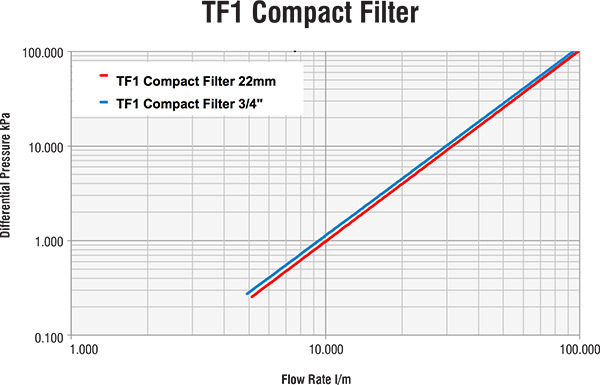 The following information shows the pressure loss in kPa over the TF1 Compact Filter under different flow rates. An average domestic central heating system flow rate of 15L/ m ( 0.25L/s) would result in a pressure drop over the TF1 Compact Filter of 2.0 kPa or 0.29 psi or 0.02 bar. 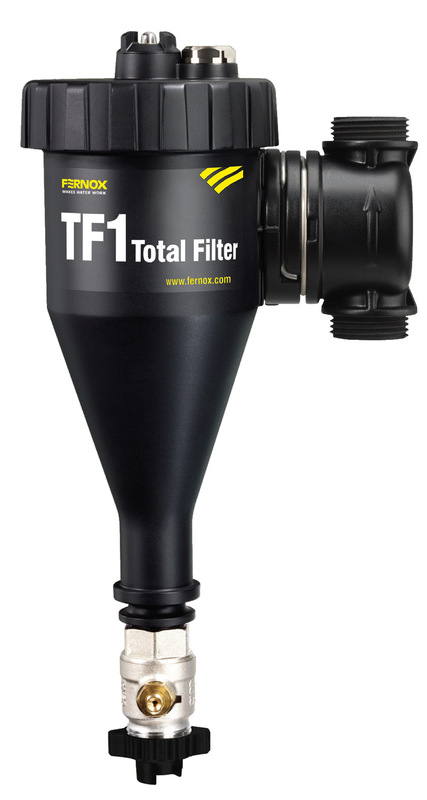 The Fernox TF1 Total Filter (UK patent granted No. 2448232) is a revolutionary in-line filter, which combines hydrocyclonic action with specially designed magnet assemblies, to remove both magnetic and non-magnetic contaminants from system water and contain safely within the filter. The Fernox TF1 Total Filter can be connected directly on to the pipework using the valve fittings provided. The Fernox TF1 Total Filter is supplied ready to install into vertical pipework with system water flowing upwards. Further installation instructions are provided with the unit. 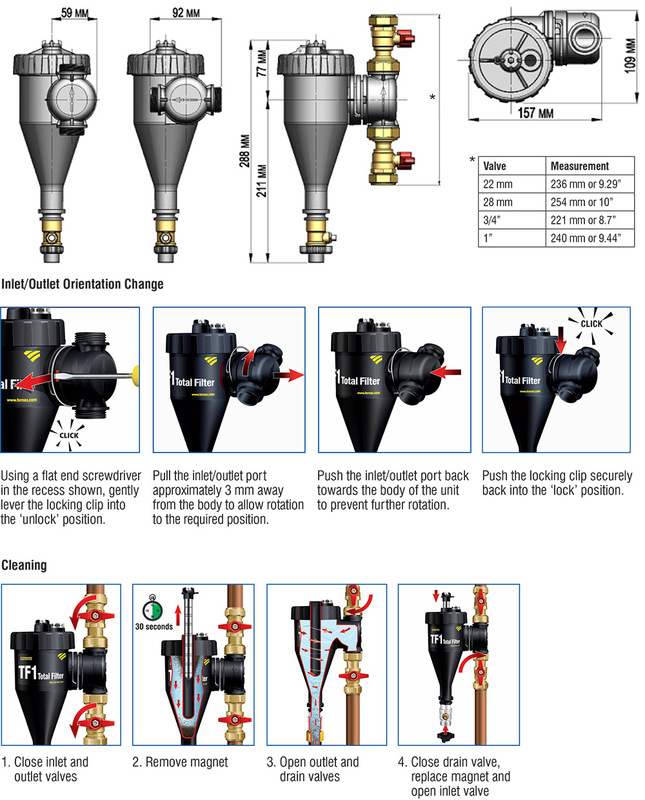 The TF1 Total Filter can be installed in any one of 24 separate orientations enabled by its unique inlet/outlet mechanism, to allow the flow to be in any direction as it passes through the unit. 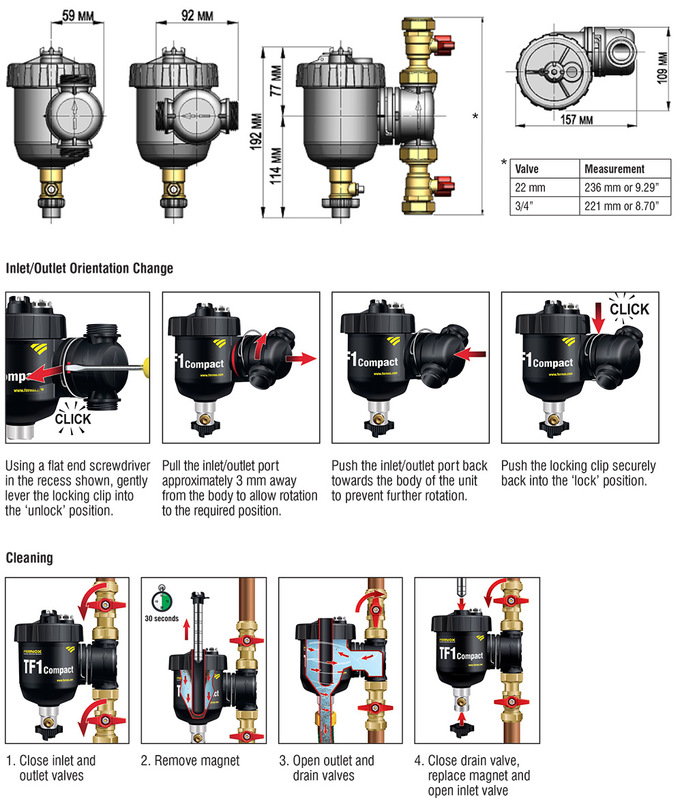 Individually packaged with all valves and detailed instructions included. No special storage requirements needed. 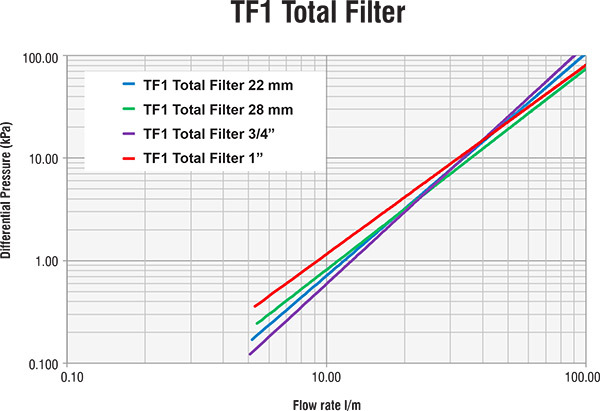 The following information shows the pressure loss in kPa over the TF1 Total Filter under different flow rates. An average domestic central heating system flow rate of 15L/m (0.25L/s) would result in a pressure drop over the TF1 Total Filter of 1.0kPa or 0.145psi or 0.01 bar. Registered Office: Unit 33 Anniesland Business Park, Netherton Road, Anniesland, Glasgow G13 1EU. 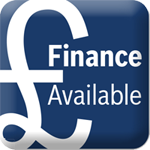 William Smith Heating Solutions Scotland Ltd is authorised and regulated by the Financial Conduct Authority for the purposes of credit broking FRN 793528.